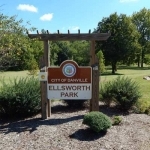 The City of Danville is getting a $373,900 grant for improvements at Ellsworth Park. Mayor Rickey Williams, Jr. announced that the city has been awarded an Open Space Lands Acquisition and Development (OSLAD) grant from the Illinois Department of Natural Resources. The City’s project, the redevelopment of the historic Ellsworth Park, was one of 89 projects chosen to receive funding by IDNR. ‘’I’m so proud of Steve Lane and everyone on our team who helped make this happen,’’ said Mayor Williams. He says it will be a tremendous boon to Ellsworth Park and the entire city. Lane is Danville’s Superintendent of Parks and Public Property. He said earlier that the funds would be used for a multi-use football and soccer field, new picnic shelter and moving the park’s restrooms out of the flood plain along with other improvements. New Census Data Shows We’re Shrinking!